Projected growth in the LED lighting market, growing demand for the fast and secure data transfer and increasing internet penetration are some of the major factors which have resulted in the overall growth of the global Li-Fi market. In Li-Fi system, LED light component accounted for majority of the system cost. According to 6Wresearch, Global Li-Fi Market is expected to grow at a CAGR of 115% during 2016-22. Amongst all applications, retail application acquired largest revenue share of the market pie globally. Over the next six years, campus and street light applications are forecast to grow at a relatively higher CAGR during 2016 to 2022. European region held major share in the Global Li-Fi systems market in terms of revenue, owing to increasing deployment of Li-Fi systems in retail, museums, street light and small scale commercial offices. Additionally, over the next six years, Asia-Pacific region is expected to grow relatively higher than other regions attributed to large LED lighting market; China and Japan likely to register highest deployment for Li-Fi systems in the coming years. The report thoroughly covers the market by Li-Fi network components, by applications and by regions. The report provides unbiased and detailed analysis of the on-going trends, opportunities/ high growth areas, market drivers, which would help stakeholders to device and align market strategies according to current and future market dynamics. Growing internet penetration and increasing issue of RF spectrum bandwidth crunch have bolstered the growth in Global Li-Fi market. Further, growing global IT spending from $3.68 trillion in 2013 to $3.73 trillion in 2014 coupled with growing government projects to provide location based positioning are few factors that are spurring the market for Li-Fi globally. The Global Li-Fi market is primarily driven by retail and museums applications. However, street light application market is expected to experience a major growth in forecast period attributed to growing deployment of Li-Fi systems to provide location based services to the consumers. Amongst all the regions, European region has generated largest revenue share of the market pie, however during the forecast period, Asia-Pacific region is likely to become the largest contributor globally. 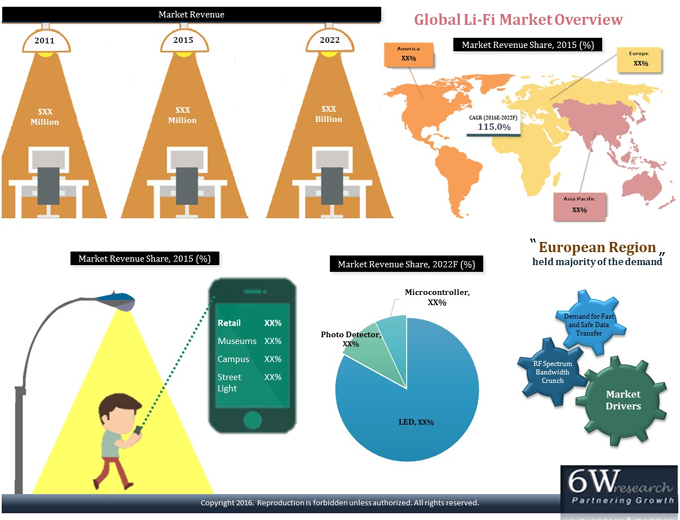 “Global Li-Fi Market (2016–2022)” report estimates and forecast the overall Global Li-Fi market by revenue, by components, by applications such as retail, museums, campus and street lights and by region such as the America, Europe and Asia-Pacific. The report also provides insights on market trends, company profiles, market drivers and restraints.